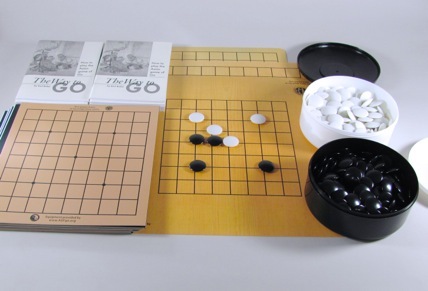 Make your media center more relevant to young users -- introduce them to the ultimate board game: Go. If you have an anime club or Asian study group of any kind, you have a likely starting point. 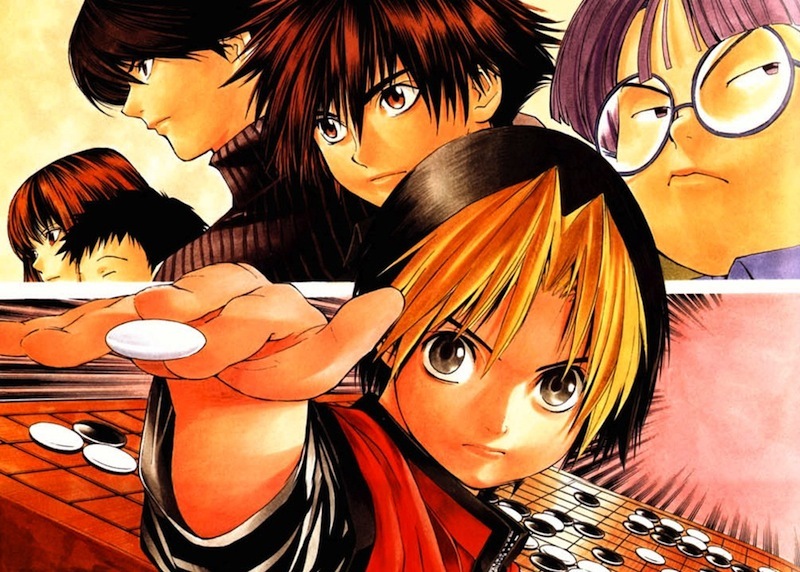 Go was commended by Confucius in ancient times; more recently, it has become the star of its own manga/anime, Hikaru no Go, a coming of age saga in the classic "Hero's Journey" style. Students who learn go develop transferable learning skills and other important competencies. Click here to learn more. Go is played by millions of people all over the world. Thousands of them are playing online right now! 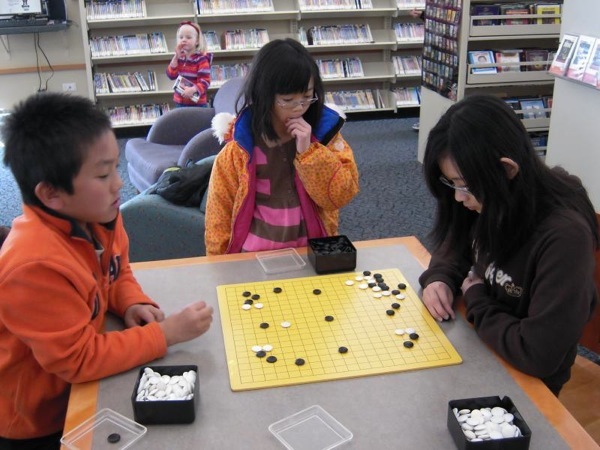 Go is an ideal window on Asian culture as well as a way to improve cognitive skills. Like the martial arts, Go can teach concentration, balance, and discipline. Each person's style of play reflects their personality, and can serve as a medium for self-reflection and personal growth. To get started, fill out our online Project Application Form. It's easy! If you have a group of kids who want to learn Go, you probably qualify. 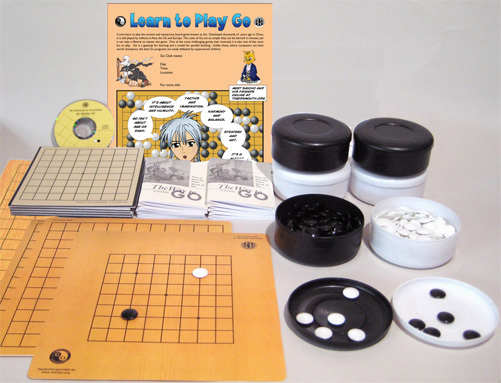 The Library Starter Set is perfect for a smaller group of kids that doesn't have a dedicated teacher who already knows how to play Go. If you have more experienced players and larger numbers, order the Classroom Starter Set instead. 2 sample issues of Go World magazine. To get started, fill out our online Project Application Form. It's easy! If you have a group of students who want to learn Go, you probably qualify. The AGF offers a 50% match on the purchase of Hikaru, for schools and libraries that launch official AGF programs. Our matching funds are capped at $200 ($400 in expenses) and can be used for reimbursement of Go related purchases, including books and equipment. Hikaru is currently still available on Amazon in print and Kindle editions, it can also be found used. Perhaps unique in the history of comics, Hikaru creates a compelling action story around a board game. All of the "fighting" takes place on the game board, a refreshing change of pace from the usual shonen manga. The manga and anime of this story are credited with helping thousands of young people to discover Go. Matching Grants for Equipment and Salaries: The AGF offers approved programs up to $200 in matching grants for equipment, and up to $1000 to match salaries of newly hired Go instructors in after school-programs and community settings such as libraries and youth centers. AGF Store: Approved programs can order exclusive supplies at discounted prices. Talented players can apply for scholarships to attend The AGA Summer Go Camp or The US Go Congress. The AGF awards two $1000 college scholarships per year to outstanding student organizers. With at least three players of any strength, your school or library can enter the online US School Team Tournament. Stronger players can try their luck in The US Youth Go Championship, where the winner plays for the US in The World Youth Goe Championship, or in the Redmond Cup, an online event where where junior and senior players earn free trips to the US Go Congress for final playoffs. Special Vendor Discounts: As an AGF programs, all your dollars go further. Most major Go vendors offer special discounts to AGF-approved teaching programs. Free Book for Teachers and Organizers: Go as Communication is a unique look at Go through the eyes of Yasuda Yasutoshi, 9-Dan, a Japanese Professional Go player. He has a passionate belief in the value of Go for children and special populations such as the elderly and developmental delays. Just send an e-mail asking for a copy. Free downloads: Get lots of videos, lesson plans, posters, and more from the AGA. Fiscal Management: Your local supporters may be able to donate to your activities through the AGF, making their contributions tax-deductible. Ask for details. In addition, local and regional funds that could help you are available through cultural, educational and civic organizations and government grants. In many cases the grantee must be a 501c3 nonprofit; that's where we come in! As an approved program, you can apply to use our corporate structure to obtain these funds, as long your project fits our guidelines. AGF Teacher of the Year Award: An outstanding Go teacher receives an all-expenses paid trip to The US Go Congress.